Timeless elegance meets timeless craftmanship with the Benotime Teddy Bear, Steiff’s latest Limited Edition release of 2017. Complete with a teacup and saucer set exclusively manufactured by Villeroy & Boch, you can be sure that Benotime Teddy Bear will be the finest coffee companion on hand. As a small ceramics maker that began its humble roots in Germany all the way back in 1748, Villeroy & Boch has since grown to become one of the most prestigious homeware brands in the world today – one that is synonymous with history, tradition, and exceptional craftsmanship. Is it any wonder then, that a collaboration with Steiff comes so effortlessly? With only 750 pieces available worldwide, this rare Steiff x Villeroy & Boch collaboration is set to become an extremely valuable Limited Edition piece with time. 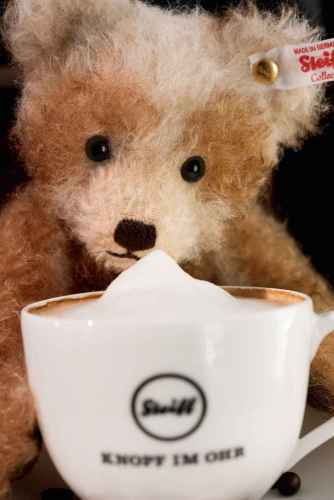 It is crafted from the finest Shulte mohair with beautiful brownish airbrushed accents; with a soft hand-stitched nose and the tiniest hint of a smile that promises mornings of aromatic coffees, charm, and snuggly companionship. Benotime Teddy also comes with a removable drawstring pouch – a perfect accessory for tea and coffee connoisseurs to stash the necessaries for a quality on-the-go-cuppa!